Originally founded in 1947, it wasn’t until 1963 that Jenn-Air began to make a name for itself in the appliance arena with the first self-ventilated downdraft range. From there, the company has been mixing efficiency, power and precision in the appliance market. If you want ultra modern, elegance and innovation in your kitchen appliances, then it’s time you check out what’s cooking over at Jenn-Air. Imagine opening your refrigerator to see an obsidian interior. 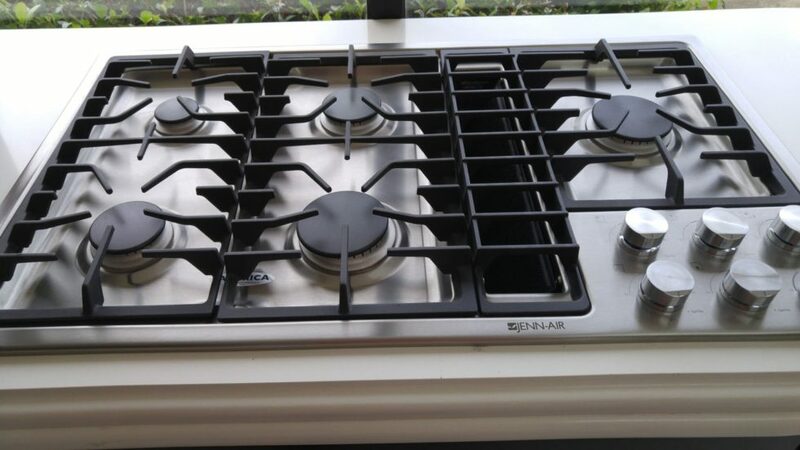 Or, imagine the usefulness and beauty of the Glass 5-Burner Gas cooktop that can fit perfectly in Euro-Style or black floating glass appliances. How would you like to be able to control your oven through your Nest or possibly even Alexa? Jenn-Air can make all your kitchen dreams come true. Jenn-Air has been leading the way with various innovations in kitchen appliances. Consider the Induction Downdraft Cooktop. Imagine a stove with unobstructed access to heating resources. Forget the four burners of your standard stove. Now, you can have access to an entire stovetop surface that heats. Easy to access, and with black glass, it’s easy to clean. Your kitchen becomes a model of efficiency as well as beauty. Far too often, your kitchen has poor ventilation, but imagine a stovetop that has a ventilating downdraft that grabs smoke and cooking odors, circulates them through a filter and expels them as clean air. Jenn-Air is leading the way with modern ideas for your kitchen appliances. Call or visit us today to learn more about the Jenn-Air appliances we carry. Let’s turn your kitchen into a modern marvel. Click here to learn more about Kitchenaid Kitchen Appliances.